Linen is one of the signature fabrics of Elite Flyer’s hometown – Miami Beach, Florida. We may now operate on a global scale, but we still cling to our South Florida roots, and our choice to offer linen business cards may have something to do with that. South Beach is known for its sleek style and impeccable taste when it comes to fashion, and linen, with its naturally luxurious appearance – fits right into this hip beachy groove. Somewhat casual, totally stylish, eye-catching, and tasteful, linen is one of those fabrics that instantly lends class and outstanding looks to any outfit, no matter what city you live in. And it does the same thing when you use it as the backdrop for your business card. The texturized finish of these cards is similar to that of freshly washed linen – crisp, clean, and just a tiny bit rustic. They evoke a feeling of sturdiness, longevity, sophistication, and “hominess.” When you print a linen business card, the “fabric” finish will instantly lend the name on the front an air of time-tested dependability. 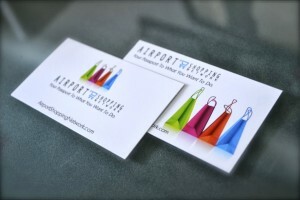 As an added bonus, linen business cards are also elegant and attractive. Elite Flyers’ linen business cards are not actually made of linen, but the cardstock we use does a great job of mimicking the look and feel of real linen. The cardstock is actually 100lb paper stock that is designed with a crosshatch texture. Again, this gives the cards an exceptional touch and a unique appeal, but because Elite Flyers does such high-volume gang run printing, we are able to offer linen business cards at an exceptionally low price. 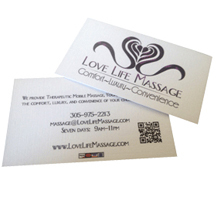 You can have these beautiful, “grown-up” looking business cards printed in your customized design for as little as 2 or 3 cents per card. You can choose to print the cards in full color for no added cost, but some of the most striking designs for linen business cards are printed in simple inks. You can choose traditional fonts – old style fonts like Apple Chancery, Courier, Copperplate and Engravers all look great on linen business cards because they go with the olden-style look and feel of the business card material. But you can also go against the grain and use a surprisingly modern font on your linen business cards if you want to employ some contrasting, contradictory design elements on your cards.